It was business as usual for many climate indicators. From flooding in southern Alberta, which was Canada’s costliest natural disaster ever, to the warmest year on record in Australia, many climate milestones were broken in 2013. This map, published in the Bulletin of the American Meteorological Society, shows the year’s notable extreme climate events. Click image to enlarge. 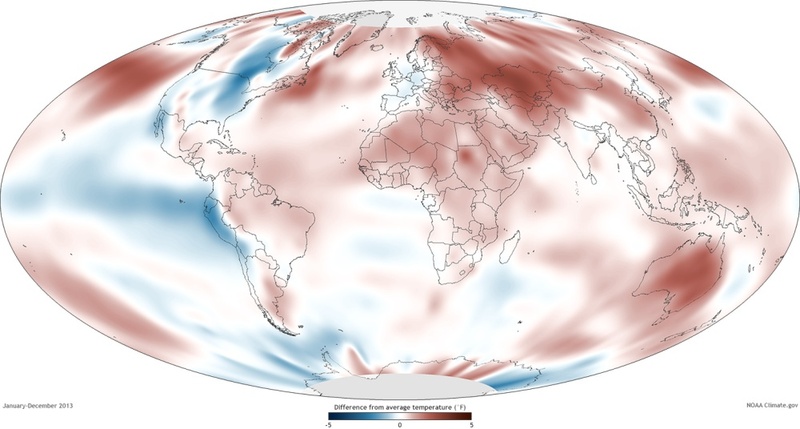 Climate data show that 2013 followed familiar trends, according to the State of the Climate 2013 report published by the Bulletin of the American Meteorological Society. Last year was one of the ten hottest on record. Depending on how scientists slice the numbers, the year ranked second or sixth. Australia experienced its hottest year since recordkeeping began in 1910, as did a research station at the South Pole, whose records date to 1957. Average sea levels continue to creep up at consistent rate, of roughly three millimeters per year. 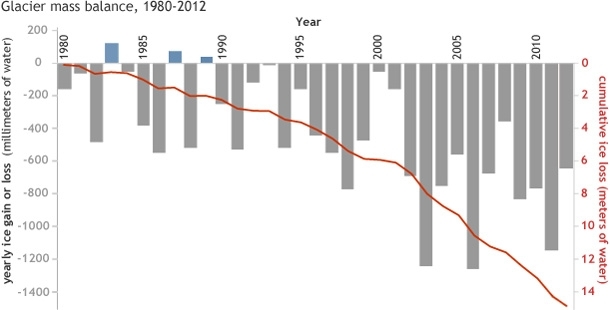 Glaciers are losing mass at an accelerating rate. Extreme events in 2013 caused significant damage. Typhoon Haiyan was the strongest recorded tropical cyclone at landfall when it crossed the Philippines in November with wind speeds of 170 knots (195 miles per hour). More than 5,700 people died because of the super storm. In Canada, heavy rains flooded southern Alberta, resulting in the country’s most expensive natural disaster ever, at more than $US 6 billion. Several maps from the report put the global changes in perspective. Highlighted by Australia’s record-breaking year, global temperature data show that 2013 was among the ten hottest years since 1880. Depending on the dataset used, 2013 ranked either second or sixth. Average temperatures for the last 37 years have been above the long-term average. Surface temperatures in 2013 compared to the 1980-2010 average. Eastern North America saw colder than average temperatures, but heat prevailed on every other continent. Click image to enlarge. The world’s ice rivers stuck to a familiar path in 2013: downward. Only preliminary data are available, but the numbers suggest that 2013 was the 24th consecutive year in which the world’s glaciers slimmed down. The loss of mountain ice is a global pattern. Of the 96 glaciers assessed in Austria, 93 lost mass. In Norway, 26 of 33 glaciers shrunk last year. In New Zealand, the thermal balance point on the mountain between where glaciers melt and where they expand moved to higher elevations, meaning a retreat is likely. Three glaciers in Nepal, however, registered the highest increase in mass in nearly a decade. The 30 “reference” glaciers for which long-term data exist have lost nearly 50 feet (15.1 meters) of vertical ice thickness since 1980. More than 370 million people live in a basin where glaciers provide at least 10 percent of the river flow, the report states. The World Glacier Monitoring Service tracks annual changes for 30 “reference” glaciers – those with the longest statistical records. In only three years since 1980 has the group grown larger (blue bars). Every other year registered a net loss (gray bars). The red line shows the cumulative loss of ice. The changes are happening more quickly than just two decades ago. Click image to enlarge.